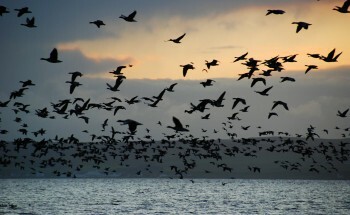 Welcome to this weeks Islay Nature and Wildlife report with news from the bird blogs on Islay, a nature report from Jeremy and more weather talk. Now I wasn't going to mention the weather (again) but since the early winter is such a hot topic I might as well join in. I also received more images of the early snow on the Paps of Jura including one from the snow on Islay which stayed for a couple of days on higher grounds. The early Arctic attack of cold air this season made temperaturs plunge to the coldest in October for five years. The snowfall by the way was the first significant one in October since 1980, reason enough to mention another extreme week of weather in this weeks report. Gordon Yates, still on Islay, had the following to say about last weeks weather: "After last weeks stormy weather the last seven days have been much better with the last two being the best Autumn days I have ever seen on Islay. We have had four days with snow on the hills which is unique for October". Gordon also mentioned a record, providing it is of course: "On one of the two magnificent days we were able to establish a record that will take some beating - seeing seven of Islayâ€™s diurnal raptors in one hour! (Golden Eagle (2), Buzzard, Hen Harrier, Peregrine, Sparrowhawk (male and female), Kestrel and Merlin)." Very impressive if you ask me, and it will be hard to beat! This weeks Islay nature report, nr 42, by Jeremy Hastings, the Islay Wilderness Guide: This week winter arrived with a vengance from the north. 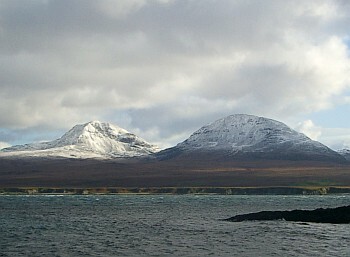 The Paps and high hills on Islay were covered in snow and even on the coast early morning was dusted white. There was frost too. Woodcock have arrived and also the big excitements were a couple of grey Phalaropes and a Waxwing in Port Charlotte. Thrushes have been piling in red wig and Fieldfare in large flocks and Blackbirds too. In a neighbour's garden this very morning were 27 of them feeding on the fallen apples! The geese, of course continue to delight and even more so with clear blue skies and long distant views of Donegal and Ulster. Golden Eagles soar and Merlins scatter finch flocks as they speed across the moss land like jet fighters inn a far distant land. I was cycling back over the glen the other day when I was aware that I was riding along a Merlin for a couple of hundred meters, we had time to eyeball each other before he slew off into open filed. Fantastic! There are so many Buzzards now it is a wonder that there is enough food to go round as one can see them almost one an acre! Great Northern Divers are slowly returning to Loch Indaal although not in the numbers as have previously seen at this time of year.... ah but there is time yet and nature follows it's own mystical course with our diaries and does quite well inspite of mankind!